Rob Ford is set to return from rehab to City Hall. 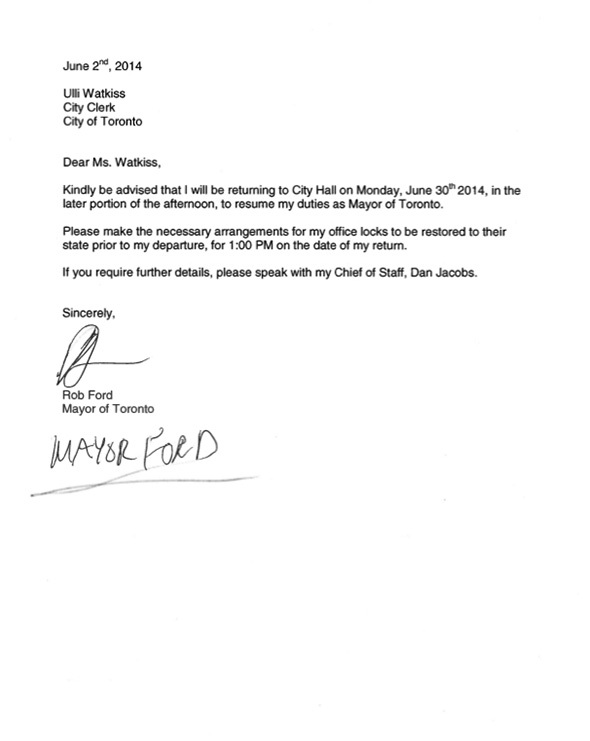 The Mayor of Toronto filed a document with the city clerk earlier today indicating that he would be back at work on June 30th. Well, to be more specific, he plans to return to his (limited) mayoral responsibilities some time "in the later portion of the afternoon" on the 30th. Way to come back sharp, Rob. I'm not exactly sure why I find this so funny, but it strikes me as priceless. Ford can't even commit to a time that he'll be in after 1pm. More seriously, this news is bound to light up the mayoral race, which has actually been rather boring so far. Ford left for rehab in early may, making his stint roughly two months long. There will be many questions that accompany Ford's return, the most obvious of which being can he get himself back into the race? One suspects that if he stays clean and if there aren't more bombshell allegations waiting to be revealed, he has a very good chance of doing just that. Also of note from Ford's return letter, he signs his name twice. You know, just to make sure that the recipient knows who the author is.